**EDITED** This is a slight re-post of yesterday's project, with a few more photos and links. :-) Enjoy! Hi everyone! 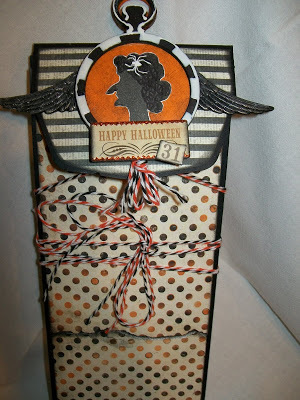 It's Shannon back with my final guest designer post for October! 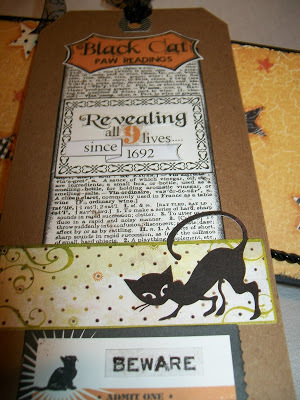 I had a great time playing with the eTeam this month and am excited to show you my Halloween-inspired album that I created using a Graphic 45 Black Policy Envelope spiral book. This is such an awesome book to play with and all the pockets that are in it that you can fill, it's great! 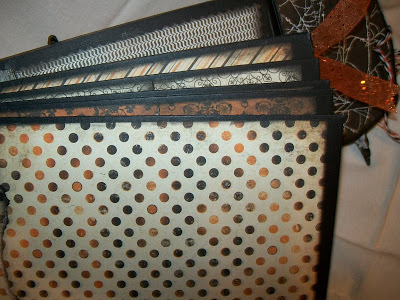 I of course had to use the Charcoal and Mandarin Orange twine from The Twinery to go along with my album and I used that to decorate the front flap of the album. On the front cover I also used the wings from the "Adornments-Regal" from the Tim Holtz Idea-ology line, which were behind the Wendy Vecchi Studio 490 Art Parts "Pocket Watches". 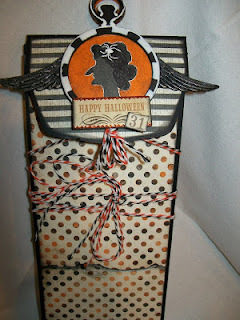 I love the Art Parts, isn't this a fun way to use the Pocket Watch...as a spooky adornment!! One of the newer stamp sets from Stampers Anonymous/Tim Holtz is "Artful Silhouettes". 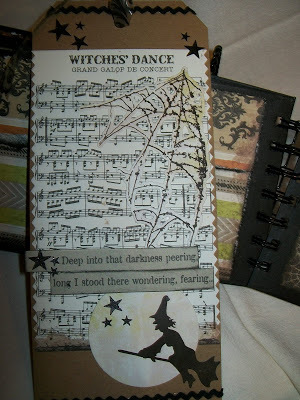 There is so much more you can do with these stamps aside from just having the silhouettes in the middle of the frame. As you can see from my project, I used one of the women silhouettes and since it was a Halloween project I extended her nose and chin with a black marker....genius, right? (**Hint** On another Halloween project I recently made I used one of the men silhouettes and I gave him fangs!) 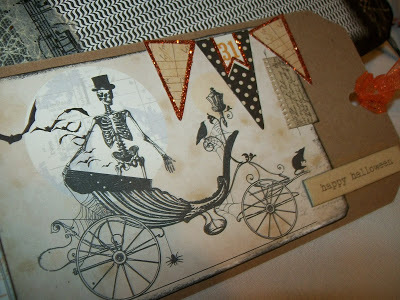 If you don't already have this stamp set, I encourage you to get it. Not only is it fun but as I said there's so, so much you can do with it. I used Authentique "Enchanted" 6x6 Paper Pad to decorate the pages. 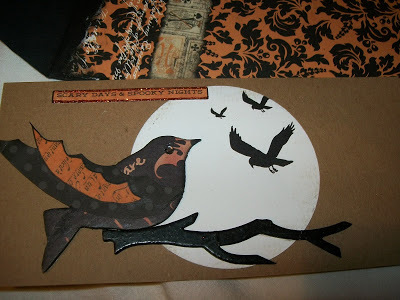 I also used Claudine Hellmuth Studio Paints in Orange and Charcoal Black, the Inkssentials Black & White Enamel Accents and the Inkssentials Surfaces #8 Kraft Tags....Love those tags! Thanks so much for visiting the eP blog today and checking out my project! There are more photos on my blog so feel free to come on over for a visit! Thanks again to the eP team for letting me share in their creative journey this month! Wow - lovely to see some more details, what an amazing project!